There's some pretty nice Amazon deals going on just for today on Transcend SDHC, Compact Flash, and SDXC media today only . I've compared the deals to other big box retailers and though Compact Flash and SDXC media are also on sale, the most significant discounts are mainly on the SDHC media. I'm actually using mostly Transcend media in ALL my cameras, and the 32GB SDHC Class 10 can handle video mode in the Canon 5D Mark III with ease, and it's on sale today for just $16.99 right now (click here). Posted in sdhc. Tags: sdhc, Transcend Media, transcend sdxc on November 16, 2012 by Emm. I was looking for a pretty inexpensive USB 3.0 card reader that can support Compact Flash, SDXC, and SDHC and decided to test the USPEED Multi Reader based on the many positive reviews (and of course the price). Compared to an older Belkin multi-card reader I have, I can immediately see the USB 3.0 speed difference. I'm using it with the new MacBook Pro Retina, and files are transferred more than twice as fast from the Compact Flash. For SDHC, the MacBook has a built in reader and the speed is just about the same (no benefit there if all you use is SDHC). On our iMac the USB reader works great, but the cable built into the unit is a bit short so it won't rest flat on your desk. It just sort of hangs. For traveling laptop users, I welcome the short cable. If you need a USB 3.0 multi-card reader, check out the other reviews on Amazon (Click Here). Posted in Random. Tags: Card Reader, Compact Flash, sdhc, sdxc, USB 3.0, USB Multi Card Reader on September 26, 2012 by Emm. Here's a great deal on the Sandisk 64GB SDXC media going on today. This makes it even cheaper than what Transcend has to offer. Definitely a good buy for those who need the 64GB space or SDXC file format. (click here to compare some prices on SDXC via B&H). Remember that all the new cameras are starting to move towards the SDXC format including the new 5D Mark III, and it's way cheaper than getting compact flash media (as seen here). SDXC is backwards compatible so it will work on your cameras and portable recorders that are using 'SDHC' today. The same 64GB in Compact Flash will run you a minimum of $140 dollars +, and with SDXC it will run you just under $49 bucks (today), which is almost three times cheaper. I've been successfully using SDHC and SDXC media in my 5D Mark III for several hours of video, so I highly recommend investing in SDHC or SDXC if your cameras can take it. Posted in sdhc. Tags: 64GB media, Compact Flash, Sandisk, sdhc, sdxc, transcend on April 27, 2012 by Emm. Amazing deals on Sandisk media that's hard to resist. In fact, the price break brings the super high speed, undoubtably reliable Sandisk media smack down in Transcend price territory. We're talking about 400x on CF and Class 10 on SDHC media. Sandisk media is often counterfeited, so watch out for things that look too good to be true. 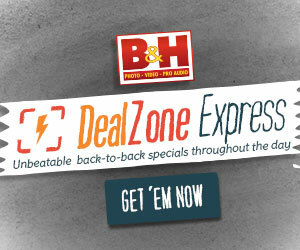 Over at B&H you'll know you've got the real deal and warranty to back it up. It might not be incredibly obvious but all you need to do is add at least (2) two of these items into your shopping cart to qualify for the discount. Available in select Compact Flash and SDHC media. Your chance to stock up while it lasts. A very rare deal indeed..
Posted in HDDSLR Events, Photography Gadgets, Videography Gadgets. Tags: 400x, class 10, Compact Flash, dslr media, Sandisk Deals, sdhc on June 28, 2011 by Emm. What is Eye-Fi? It's an SDHC card with built in wireless capabilities to send the photos or videos directly to a computer or uploaded to the Internet (originally). Well with Eye-Fi's new Direct Mode on the Mobile X2 SDHC card, your camera will automatically send the image from your camera directly to your Tablet or SmartPhone via an Ad Hoc network (directly). This includes iPads, iPhones, and Android devices. You'll need to configure the card's wireless settings (just one time), and then from there it's all gravy. The new Mobile X2 is available now, and older X2 cards might get this feature via a firmware update. This totally simplifies the workflow for Photographers that often use this wireless tethering technique to view images with their iPads for a full blown view on Exposure and Color Balance. Heck, might be a good way to dial in your video exposure settings too. Yeah I know what you're thinking. Only cameras with SDHC so what about Compact Flash shooters? From what I remember, the cards even work with Compact Flash to SDHC adapters. Keep in mind that by using this technique you'll be dropping the speed rating down enough that the camera might not be able to shoot HD video. Of course still photos should hold up pretty well. Check out some of the adapters below. Posted in eye-fi, Photography Gadgets, Videography Gadgets. Tags: direct mode, eye-fi, sdhc, wireless card on April 17, 2011 by Emm.